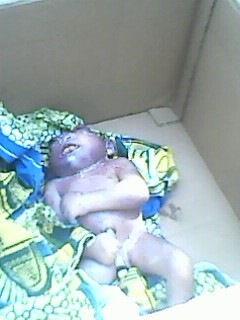 A mysterious baby was last Saturday born in Riyom, 20km Southwest of Jos the Plateau State capital with no brains. The baby was reportedly born with complete teeth and bulged "frog-like" eyes in Korongfang village around the boundaries of Plateau and Kaduna States. The baby was prematured but had features of a 10-year old, its mother, Mrs. Nchong Musa, said in an interview. "It was in its 7th month when I started having abdominal pains which were followed by a water break," she said in a local dialect through an interpreter. Although the baby died minutes after delivery, Mrs. Musa had an encounter with some mysterious creatures believed to be evil spirits the night before her baby was delivered, a memory that still torments her. Details of this and other stories to be brought to you in April edition of The Light Bearer Newspaper.